I’ve seen more SEO interest in Pinterest in the last month than the rest of the image bookmarking site’s life. One day, I saw multiple veteran SEOs ask for an invite and I’m pretty sure they’re not going for cute animal pictures and interior decorating ideas. Most of the SEO talk about Pinterest concern a couple of key tactics: (1) getting people to pin pictures of your products (aided by adding the “Pin It” button to product pages), and (2) seeding your site images to topical influencers where they are likely to get spread through “repinning” (similar to Tumblr’s “reblog” feature). Each “Pin” links back to the page the image is shown on OR the actual file location using a do-follow link. The difference depends on how the image was pinned. For example, opening an image in its own window/tab and then using Pinterest’s bookmarklet will create the pin and link to the file location jpeg. The “Pin It” button will usually link to the page the image is featured on. A page-targeted link is probably better than a jpeg-targeted link unless you’re purposely optimizing for image search. Do-follow links are found on multiple parts of a pin, as shown below. The “From:” link and the image link are both standard in every pin. All image ALT attributes read “Pinned Image” with no way to edit. 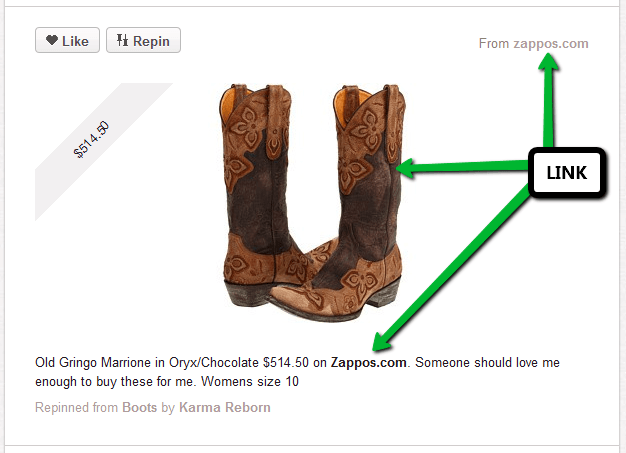 You can also insert links into the pin description and comments (here comes Pinterest comment spam). A pin comes with a custom embed code for easy syndication onto other websites, creating backlinks to the pin page. Pinterest’s domain authority, by most SEO standards, is high and still growing. 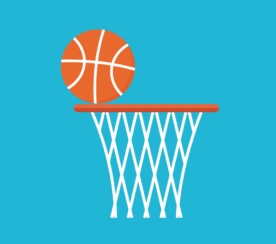 There’s always the possibility that Pinterest could convert the do-follow links to no-follow to curb spam, just as some other social bookmarking sites have done. One of the easiest ways to get links from Pinterest is through link reclamation – finding pins tied to you and your company that aren’t linking to you and request a change. I’ll walk through a basic example using ZAGG, since this has been successful for us. 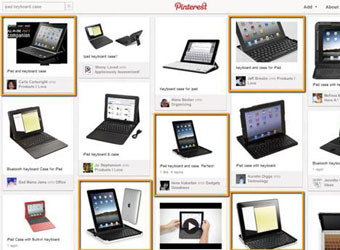 Think of Pinterest SEO in terms of linkable image assets. Which image properties do you own that people might want to pin. Pinterest is an aesthetic network: what aesthetic content are you creating? What are the keywords associated with your images? 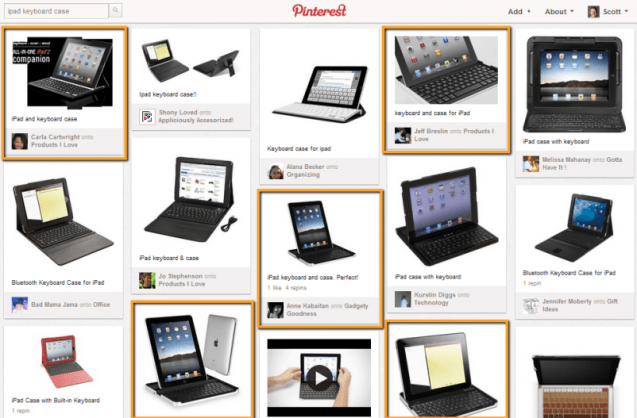 The reality is that many companies don’t care about imagery, so Pinterest doesn’t really work. E-commerce sites are probably the best prepared to take advantage of this kind of link building. 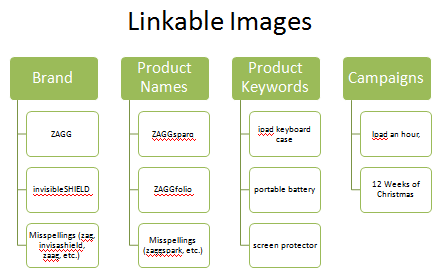 I divided ZAGG images into four keyword categories: brand names, product names, product keywords, and campaigns (including infographics), then picked a few of the keywords associated with each category. Using the Pinterest search box, I search for tags that correspond to our images. Ultimately, I find a combination of ZAGG logos, product photos, and advertising. Remember to search by how people tag, not how you think they should tag. These are all great opportunities that wouldn’t have been identified without doing more generic keyword searches. Most of ZAGG’s images are getting onto Pinterest because people found them on our website. 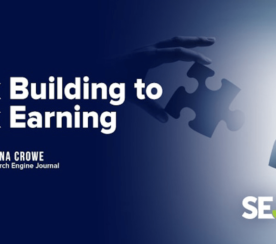 The rest of them come from a combination of affiliate and shopping sites, blogs, and even Google Image Search, even though we created the images. You can determine from the pin page where the image links to. 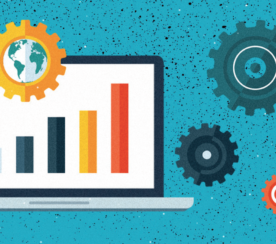 Those that aren’t linking to your site are great candidates for outreach. I should also mention that pins linking to the image file may be worth changing to link to the web page, for multiple reasons, including better SEO. a. Make a direct request. b. Make a case for the change. Make the request by contacting the Pinterest user with the text box on their profile page. If you don’t get a response, many users have links to other profiles where they can be contacted. Give visitors to your pin (and repins) the best, quickest way to get more product information, up-to-date product information, more images, and immediate purchase. Avoid brand confusion, misinformation, and misrepresentation by linking to the original source. Ultimately, it’s important to make a direct request with a benefit and explain how to change the pin. Changing pin links is easy – just click the “Edit” button associated with the pin and change the URL. Interestingly, the new URL doesn’t even need to have the image on it (but you’ll be more successful if it does). It’s best to include the Pinterest pin URL and the new URL you want associated with the image when making the request. Side note: if someone changes an image link, the image links of those who have repinned the original pin do not change. You’ll have to request changes from each individually. I’ve got a couple of Pinterest invites left if you need access and let me know. Or connect with me right on Pinterest.